It is very important to stay hydrated by drinking water. I have recommended various brands of flavored water to you in the past, like Hint water. I have also told you how I make my own lightly flavored and refreshing water at home. But sometimes I crave something beyond water or flavored water, don’t you? That’s why I also like to keep a few drinks on hand to enjoy during those times, and Honeydrop Honey Drinks fit the bill perfectly. 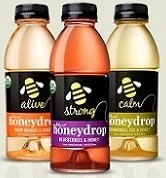 I can’t give enough praise to Honeydrop Honey Drinks, which are aptly billed as kosher, low glycemic, and organic. You may recall that I like to use honey as a natural sweetener in various foods. Honey is three times as sweet as table sugar, which means that you can use less honey to sweeten your food. If you like honey, you’ll love these delicious and good for you drinks that are sweetened with, you guessed it – honey. These drinks are infused with honey and non-carbonated, so you don’t get the bloat of soda (I hate that feeling) and are USDA certified organic. I even like the packaging (BPA-free bottles). Perhaps more importantly, Honeydrop drinks are only 80 calories for 16-ounces (1 weight watchers points plus point) – drink only half and you have a 40 calorie drink that tastes oh-so good. The drinks are made with water that is blended with either tea or juice. There are currently three varieties of these delicious drinks available - including Bee Calm (this variety has a rich infusion of organic honey and essence of chamomile to soothe the senses), Bee Alive (infused with organic orange peel and blood-orange juice and billed on the Honeydrop website as perfect for alleviating morning sickness and nausea), Bee Strong (with organic honey and blueberry) and Bee Good (this is the variety that I tried that is infused with organic honey and organic apples). Honey is so very healthy for you. I remember as a child, my mother always gave us a teaspoon of honey to fight a cough during cold season. (That might have been the only good thing about being sick). Honey has been touted over the years for fighting everything from arthritis to allergies. You can buy Honeydrop beverages at some Whole Foods stores, and they are popping up at other natural food stores as well. Maybe I could get my son to try these. He's 10 and HATES cough drops so he wont eat them. This is a good idea tho!